Headache pain and nausea decreased the following day, but then stuck around for a solid week. I had my regular quarterly oncology checkup on the 17th. When I told my oncologist, he suggested that I stop taking the anastrozole for a month, and I will see him again in June. He also set up a head CT scan (which happened the morning of May 24) and a referral to an ear/nose/throat specialist, whom I'll also see in June. He also performed some basic in-office tests to rule out anything vestibular. He asked, "You felt the room spinning?" Oncologist checked his drug listings and informed me that dizziness is not a common side effect of the med. 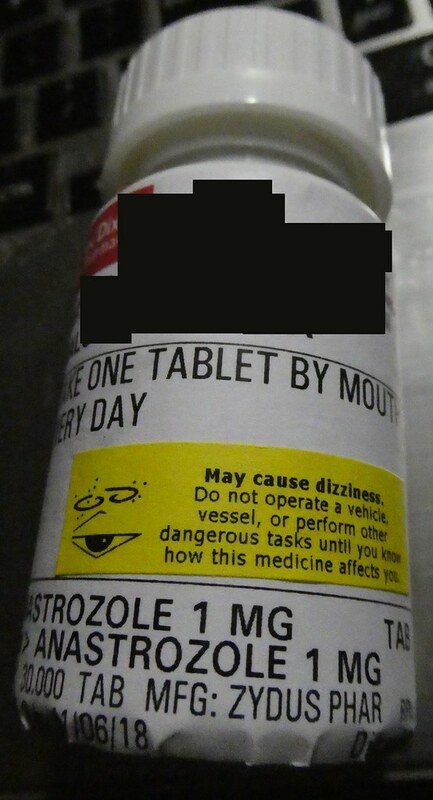 "It says, 'May cause dizziness' on the bottle," I replied. That being said, my vertigo had begun with chemo and persisted through radiation, even before I had started on the anastrozole. But even during chemo, I had never experienced an episode like that. Anastrozole has been an adventure for the 3-1/2 years I've been taking it. The first side effect had been exacerbation of my carpal tunnel syndrome (first reported two months after I had begun taking it). That and the vertigo had been pretty much it until a bit more than a year ago, when I was hit with severe fatigue -- even worse than chemo fatigue. That had been remedied with B-12 shots and I've been taking supplements ever since. Thanks to my support group, I learned that others who also took anastrozole had experienced that same kind of fatigue. Then I was hit with tenosynovitis (tendon inflammation). Again, my support network -- this time at WhatNext -- provided anecdotal evidence that anastrozole causes this, too. I dutifully report all these side effects to my oncologist, adding that thus far it's all been manageable. But anastrozole has been gradually losing favor with us. He first suggested I might want to discontinue the med after I was hospitalized in 2016 for a port-associated blood clot, since any hormone therapy (which anastrozole is) carries a slight blood clot risk. Back then I asked around, got the mixed perspectives from my medical team, weighed everything against my own priorities, and decided to stick with it. I began my anastrozole hiatus on May 18. My headache and nausea dropped significantly from its week-long steady state on May 21 and was gone by the next day. My other side effects still remain as of this writing. Be interesting to see what happens by the time of my June oncology appointment. By the afternoon of May 24 -- just a few hours after my CT scan -- the results were up on my patient portal. With my headache and nausea fading several days after I had stopped taking anastrozole, I suspected I'd been dealing with yet another side effect. But it was nice to get confirmation -- and lickety-split at that -- that my brain seems fine. In spite of the side effects, I'd be lying if I said I didn't feel some separation anxiety from the anastrozole. Taking it has become one of those cancer rituals and a kind of security blanket. But we have reached the point where its small benefit (given my overall risk) did not outweigh the physical cost. Whether I resume taking it after the one-month gap is yet to be determined.